Review: The book I choose to review was The Dark Stairs written by Betsy Byars. The book is the first book in the Herculeah Jones series, introducing the main characters, the feel of the story, and Byars chosen writing style for this series. This book is patterned the same as the rest of the series, so if you like this book you will probably like the others, however if you don’t like this book, the rest of the series won’t interest you either. Herculeah Jones is not your average girl, she’s strong, tall, flexible, and very athletic. She has inkling for danger, a strong mind, and an insatiable curiosity. Her mother is a private investigator, her father a policeman. When she spots her father over at “Dead Oaks”, a place of local legend, and the scene of an unsolved murder mystery, and later sees her mother with a very mysterious man who seems overly concerned with this place, Herculeah’s inner detective is awakened and the adventure begins. The plot is very slow in the beginning and it’s hard to stay interested, but as the mystery progresses it’s hard to put the book down, however, this not until more than halfway through the book. Herculeah was a somewhat boring character and hard to connect with. Meat (Herculeah’s friend and “sidekick”) is a bit more of a complex and entertaining character. The setting is wonderful. In the small average town, the mystery house where a man disappeared and a man was said to have been murdered. The voice is engaging and interesting. 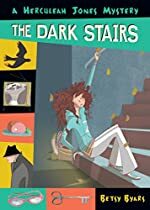 Overall the mystery of The Dark Stairs earned a total of 2½ stars from this reviewer. Review written by Breanna, Grade 7. Date of review: May 2009.